Overnight Saturday Night: Cloudy, spot shower or downpour. Lows in the 50s and 60s. Sunday: Mainly cloudy. Muggy. Scattered showers and storms, especially afternoon. Highs in the 70s. Monday: Mix of sun and clouds. Spot shower or storm. Highs in the 60s and 70s. 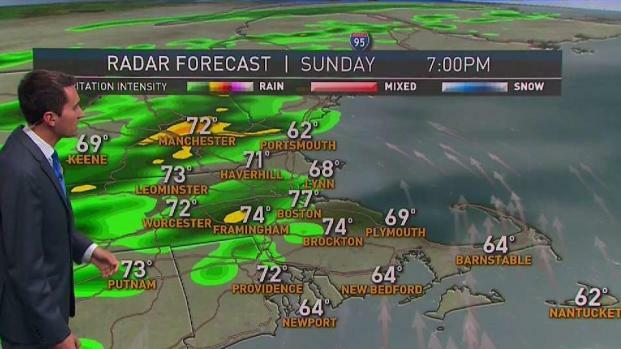 Hit and miss showers, downpours, and thunderstorms continue to move through New England Saturday evening, with temperatures holding in the 50s and 60s through the overnight. Sunday morning will be no different, with 50s and 60s to start the day. It will be cloudy during the morning, but most places will be dry. It will, however, turn more humid over the course of the day. More scattered showers, downpours, and thunderstorms will develop during the afternoon. The rain will arrive first in Western and Northern New England around lunchtime before moving closer to Boston late in the afternoon and during the evening. Highs will reach the 70s to near 80 as the rain moves in. Humidity drops, as do temperatures, heading into Monday. With a mix of sun and clouds, highs will be in the 60s and 70s. There still may be a spot shower or storm, but many will stay dry. Tuesday looks beautiful with lots of sunshine thanks to high pressure overhead. Highs will be in the 70s to near 80. Humidity bumps back up mid to late week, and temperatures return to the 80s. A front will bring scattered showers and storms late Wednesday into Thursday. Although early still, next weekend, into the week of July 4th, looks to feature warmer than average conditions.